Dedh Ishqiya is like the Urdu language: pleasing to the ear and apparently polite to a fault irrespective of the views and emotions being expressed. In precisely the same vein, this film is soaked in seeming indolence, its visual exquisiteness undisturbed at all times despite the lava bubbling below the surface in the lives of its female leads. DI is set in Mahmudabad in Uttar Pradesh where Babban (Arshad Warsi) and Khaalujaan (Naseeruddin Shah) converge to fall in love once again, in this sequel to the 2010 Vidya Balan-Naseer-Arshad-starrer Ishqiya. That one was about deception in love, a duplicitous woman and two gullible men. In a sense, the theme continues as Khaalu is smitten by Begum Para (Madhuri Dixit-Nene), the widow of the late Nawab of Mahmudabad, and Babban is besotted by her companion Muniya (Huma Qureshi). Para’s husband wanted her to remarry so she’s holding a swayamvar in the guise of a mushaira where the wily Khaalu lands up as a poet. The question though is this: who is the deceiver here? Are the men being taken for a ride by the women, or by one woman as they were by the seductress Krishna (Vidya) in Ishqiya? Or are they wiser from that experience? The cast is an assembly of formidable talents. Arshad is his usual brilliant self here, playing the naïve scamp like a second skin. Naseer-saab has done too many films in the past decade that are an embarrassment to his CV but here he proves yet again that when he invests his heart and soul in a role, there are few to match him. Besides, his chemistry with Arshad is to die for. And what does one say of Madhuri? In her first film after seven years, Ms Megawatt Smile challenges her remarkable acting skills the way she rarely did in the first leg of her career. That she has a luminous face is without question. Age has added a charming chubbiness to those cheeks. It has also given her immense dignity and elegance. She is a picture of grace in her dancing scenes. Over and above this though is the effortlessness with which she gives Begum Para an almost tangible fragility and frailty, the sort of air that would make any man – or woman – want to protect her. Huma Qureshi is a bit of a disappointment though. She doesn’t fully inhabit her role as she has in her earlier films and is somewhat put in the shade by the veterans here. To be fair, hers is the least-fleshed-out, most poorly written part of the four. The most scintillating performance of the lot comes from the amazing Vijay Raaz as Para’s ardent suitor Jaan Mohammad. It’s a joy here to watch his body language, conveying by turns the swagger of a rich man and the vulnerability of a fellow who believes that all the wealth in the world can’t give him “the DNA of a Nawab”, as one character puts it. I’ve never imagined myself saying this about him, but he looks almost dishy in this film. Jaan Mohammad exemplifies the nuances in the screenplay by Abhishek Chaubey (who has directed both Ishqiyas) and Vishal Bhardwaj. Despite the humour and thrills, the writing is replete with understated comments on class differences, feudalism, loneliness in marriage, second chances in life, male bonding and, in ways alien to mainstream Hindi cinema, female bonding. In a brief aside, we even have a new policeman in town, SP John Vijay, who speaks with a pronounced accent but is that rare southern Indian character in a Hindi film who has not been included to emphasise his “Madrasi”-ness but simply because (though most of Bollywood seems not to realise this) south Indians too exist in India. The film’s art design and costumes are ravishing, epitomised by that scene in which Begum Para first breaks into a dance in solitude. DoP Setu’s camera gives us a thoroughly atmospheric film, playing with light, shade, shadow and darkness with such skill as to make even a dusty, dilapidated, decaying haveli look picturesque. His favourite canvases though, seem to be the faces of Naseer and Madhuri, both of whose loveliness is highlighted by repeated extreme close-ups. Also a must-mention is A. Sreekar Prasad’s editing which merges night with day and day with night, with each scene seeming to flow into the next. Where Dedh compares unfavourably to Ishqiya is in the music department. Clinton Cerejo’s background score complements Setu’s cinematography. Vishal’s songs, though melodic and introspective to match the film’s overall tone, don’t offer us anything as throbbingly memorable as the earlier film’s Dil to bachcha hai ji and Ibn Battuta. Ishqiya was all fire and ice and “chutiyam sulphate”-style dialoguebaazi teamed with that blazing passion between Krishna and the men. It was a fun and unusual film but in the ultimate analysis, the elements didn’t all come together to form a wholesome whole. Dedh Ishqiya demands a different frame of mind. It is poetic and lilting and leisurely, not just in terms of the mood it creates but also in the dulcet verses by Bashir Badr scattered throughout and its heavily Urdu dialogues (written by Vishal) with which characters sound like they’re making love even when they’re stabbing each other in the back. Except for one incongruous chap called Noor Mohammed Itaalvi (played by Manoj Pahwa) and the far-from-enthralling climactic gun battle, the film rarely strikes a false note. This perhaps is why its two-and-a-half hours running time doesn’t feel like that much time at all. The title Dedh Ishqiya sounds so much cleverer than Ishqiya 2. No deep meaning there, as is evident from the team’s jestful comments in the media. 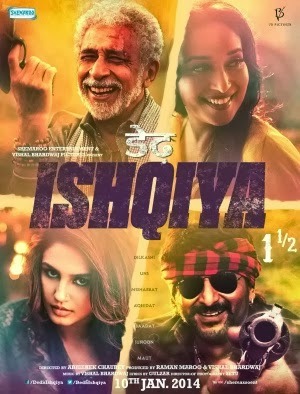 As it turns out, the choice of title is appropriate too since this film is a standalone achievement, superior in quality to Ishqiya, thus going way beyond so many Hollywood and Bollywood sequels that come across as lazy efforts to cash in on an already-successful brand name. Underlining how different the film is from so much of what Bollywood creates these days, Dedh Ishqiya ends with its best song, Hamari atariya, accompanying the credits picturised on Madhuri’s classical dance moves. So un-Mauja-Mauja-like, one can’t help thinking. I didn’t move from my seat till the very last shot. Abhishek Chaubey has arrived, people! And Madhuri is back!